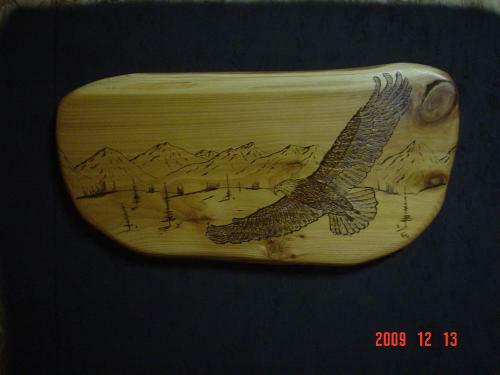 Here is an example of pyrographic images one could have in their home. Eric incorporates the chainsaw carving piece with artistic wood-burned sketches. This artistic piece is from cedar. 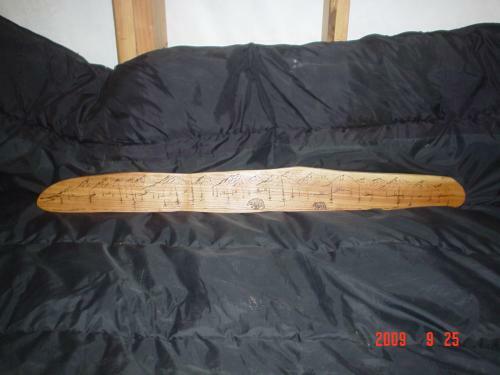 This is a close-up of a chainsaw-carved bench back which includes the art of pyrography. 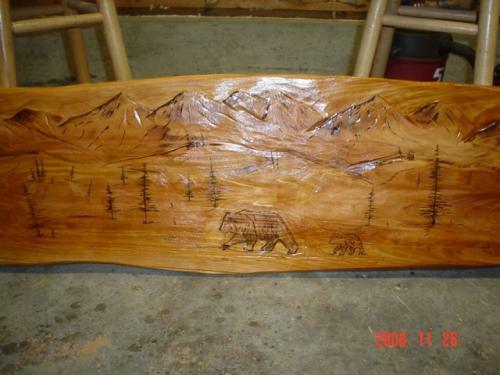 On the bench back, Eric wood-burned a typical Alaskan-themed scene of the mountains, a bear, a moose, and a small lake. 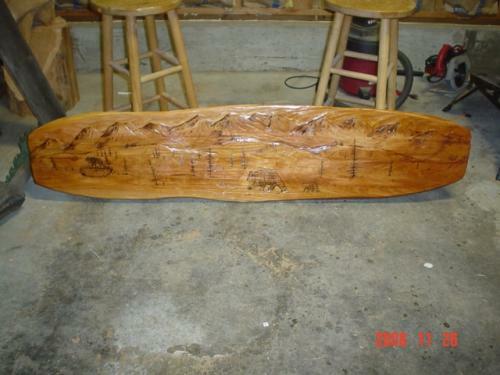 The full view of the chainsaw-carved bench back with pyrographic wood burning. 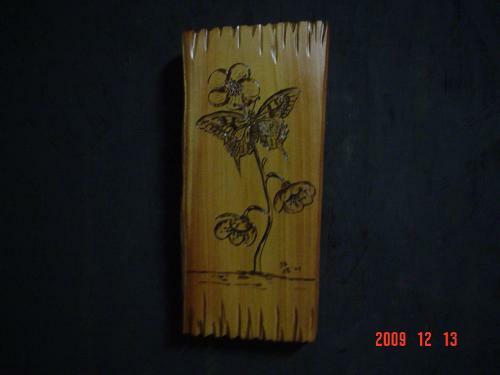 The wood burned sketches and portraits are a new product line for us. They are all fun to create and have their own personal appeal. This lovely chainsaw artwork is designed to be a focal point for any wall area. The pyrography accentuates the beautiful grain of the cedar. This particular piece was designed for someone who appreciates the tranquil grace of the butterfly. The carving is a constant reminder that Spring brings a new and fresh outlook on life. As most of Eric's sculptures are based on the natural and realistic world, he was absolutely thrilled at the prospect of designing something different. He had never created a dragon sculpture before, but learned that his brother-in-law, Eban, likes dragons. 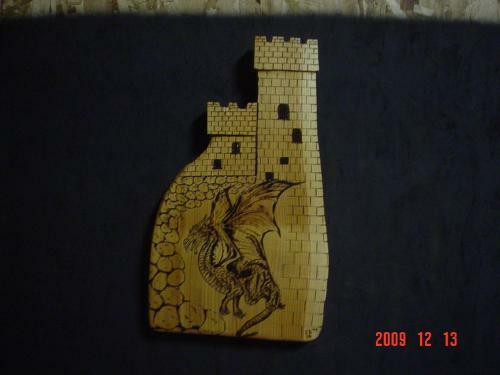 So, as a surprise Christmas present, Eric carved the castle sculpture then added the pyrographic images in order to create the sense of the dragon flying towards the unsuspecting members of the castle. A very happy brother-in-law loves the idea that he has his own unique chainsaw carved pyrographic sculpture. For all those folks who love salmon and have just about everything you could want regarding salmon, here is a little twist. 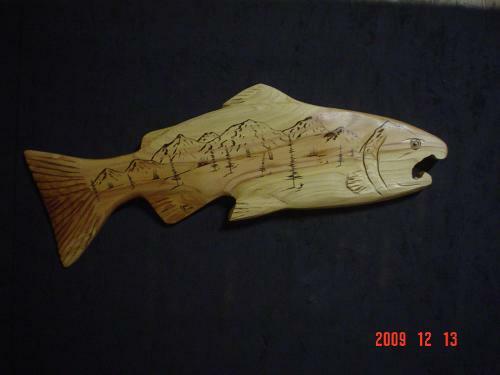 We have always created chainsaw salmon carvings and many people like just the wood sculpture itself, but we recently thought it would be neat to add a little something extra. Where do most people think of salmon if not on their plates? They think of fishing. Not only do they think of fishing, but they think of the world-class fishing found no where else but ALASKA where nature is a wonder in and of itself. It just takes the breath away to see those majestic mountains towering over gurgling streams and raging rivers or lush valleys. We thought we would give our clients a little of both with this piece of art. The salmon and mountain artwork is truly a one-of-a-kind piece of art that will be a constant reminder of the most beautiful fishing in the world...especially if you ever have the opportunity to fish on the Kenai-Russian River. One of the truly breathtaking and majestic images one will carry after leaving Alaska is of the Bald Eagle soaring over the mountains. With such grace and strength, it is no wonder the eagle is America's symbol of freedom. When you see those eagles soaring through the sky, you are just reminded that nothing is impossible and that you are only limited by your imagination. When we create our Soaring Eagle wood sculptures, we hope that just as we dare to dream at The Dreamer's Woods, our clients will allow their imaginations to soar out of the impossible into the possible of their dreams. The picture taken of this chainsaw carving is with no flash. 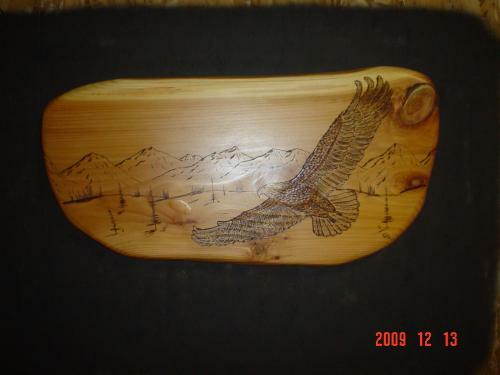 Here is a picture of the same soaring eagle chainsaw sculpture as the one above WITH the flash. Notice the grain of that beautiful western red cedar. What do you think of when you think of wild and rugged forest? Maybe you think of grizzly bears or eagles or fishing. But for some, the experience of a lifetime occurrs while camping out in the thick of nature's luscious reminder of life uncomplicated and filled with wonder, with intrigue, and with serenity. Out in those woods off the beaten path where some folks go to get away from the hectic pace of the modern world, they wait breathlessly for that magical moment in time when all is quiet and yet pulsing with promise, when the cry of a wolf breaks the night silence and they are reminded that they are never truly alone. 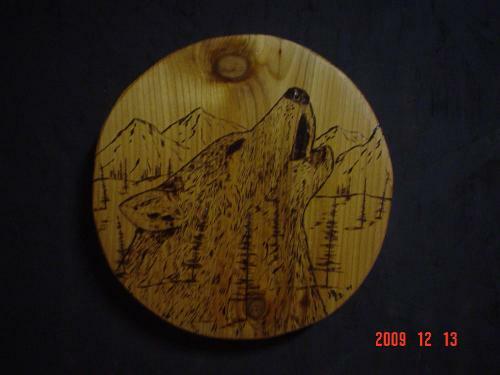 The Howling wolf pyrographic wood art captures that moment. It is truly a memorable keepsake for anyone who has ever hearkened to the wolf's call.